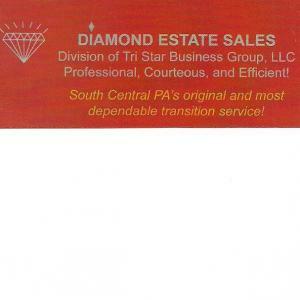 Diamond Estate Sales is South Central Pennsylvania's original and most dependable transition service. We are a family business with a wide range of expertise as an alternative to an auction service. With a massive regular customer base of over 5,000 and growing, our sell-through is typically 90-95%. Diamond Estate Sales will set up an estate sale at your location and we provide all sales materials, tables, displays, advertising and provide all labor with no out of pocket expense to you. This will free up your time and set your mind at ease knowing that our family business is handling your families estate with integrity and care. From the simplest of items, to valuable antiques, to vehicles and more, Diamond Estate Sales is most trusted in South Central PA. Diamond Estate Sales provides a free consultation and can provide references from past estate sales. Our company also offers a full appraisal service as well as consignments. We have full liability insurance and are a member of the Antiques & Collectibles National Association. Call Len Kasper at (717) 723-2252 today for a free consultation. 2 DAY HOUSEHOLD ESTATE SALE IN DOVER, PA! 2 DAY HOUSEHOLD ESTATE SALE IN MIDDLETOWN, PA! 2 DAY HOUSEHOLD ESTATE SALE IN PALMYRA, PA! 2 DAY HOUSEHOLD ESTATE SALE IN MOUNT JOY, PA! FABULOUS 2 DAY HOUSEHOLD ESTATE SALE IN GETTYSBURG, PA! 2 DAY HOUSEHOLD ESTATE SALE IN SHREWSBURY, PA! 2 DAY HOUSEHOLD ESTATE SALE IN HUMMELSTOWN, PA! 2 DAY "ANTIQUES" HOUSEHOLD ESTATE SALE IN MECHANICSBURG, PA! 2 DAY HOUSEHOLD ESTATE SALE IN WORMLEYSBURG, PA! 1 DAY MULTI-ESTATE STORE CLOSING 75% OFF TAG SALE IN MECHANICSBURG, PA! 2 DAY MULTI-ESTATE ESTATE TAG SALE IN STRASBURG, PA! 2 DAY MULTI-ESTATE ESTATE TAG SALE IN MECHANICSBURG, PA! 2 DAY HOUSEHOLD ESTATE SALE IN HERSHEY, PA! 2 DAY HOUSEHOLD & LANDSCAPERS ESTATE SALE IN YORK, PA! 3 DAY ESTATE TAG SALE IN LITITZ, PA! - ANTIQUES!! MASSIVE 3 DAY ESTATE TAG SALE IN SHREWSBURY, PA! 2 DAY HOUSEHOLD ESTATE SALE IN LANCASTER, PA! 3 DAY MULTI-ESTATE ESTATE TAG SALE IN MECHANICSBURG, PA! 2 DAY MULTI-ESTATE ESTATE TAG SALE IN MECHANICSBURG, PA!! 2 DAY MULTI-ESTATE ESTATE SALE IN MECHANICSBURG, PA!! 3 DAY ANTIQUES & HOUSEHOLD ESTATE TAG SALE IN HARRISBURG, PA! HUGE 2 DAY MULTI-ESTATE TAG SALE IN MECHANICSBURG, PA! 2 DAY MULTI-ESTATE TAG SALE IN MECHANICSBURG, PA! 3 DAY HOUSEHOLD ESTATE SALE IN SHILLINGTON, PA! 1 DAY ONLY MULTI-ESTATE SALE IN MECHANICSBURG! 2 DAY MULTI-ESTATE SALE IN MECHANICSBURG! 2 DAY HOUSEHOLD ESTATE SALE IN HARRISBURG! HUGE 2 DAY MULTI-ESTATE TAG SALE IN MECHANICSBURG! 2 DAY HOUSEHOLD ESTATE SALE IN MECHANICSBURG! This company has posted a total of 65 estate sales. Only the most recent 50 sales are shown.